Come off the M60 at junction 5 (formerly M63 junction 9). Take the first exit off the A5103 Princess Road and turn right at the traffic lights. Turn right at the next set of lights under the bridge and rejoin the A5103 heading North. After you have passed under the motorway bridges turn left at the next major set of lights heading towards Chorlton on the A5145 Barlow Moor Road. 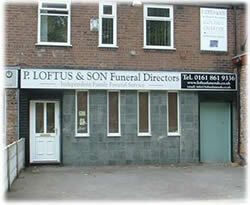 We are on the left hand side opposite Southern Cemetery. Come off the M60 at junction 5 (formerly M63 junction 9) onto the A5103 Princess Road. Turn left at the next major set of lights heading towards Chorlton on the A5145 Barlow Moor Road. We are an established family owned independent funeral directors with over four generations of expertise.